If you have a milestone birthday or anniversary coming up soon, you want to have it at a venue that can accommodate all of your guests, and that serves amazing food and drink. At Moto-i in Minneapolis, we would love to host your next event in one of our private areas, and as a Japanese restaurant and sake bar, we can provide amazing food and beverages all night long! We have three areas to choose from for your event, and will gladly explain the advantages of each one. The first area is known as Ramen Alley, and it is located on the first level of our restaurant, right next to the main bar. Decorated with bamboo walls and local art, Ramen Alley is a semi-private area, with three walls surrounding it. Guests will have a direct view of our on-site sake brewery, and you can reserve the The Shuffle Board area with this room. 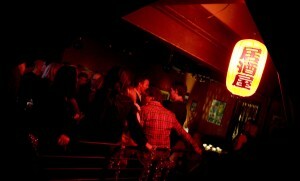 This space is ideal for parties of 15 to 45 people, and no deposit is required. Ramen Alley is booked on minimums in sales, not a flate rate, and that minimum includes all food and beverage for the party. Check with us for the current rate! 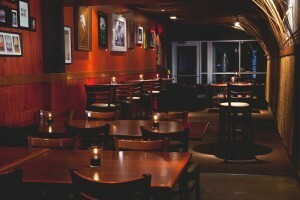 Our second private area is the Big Boy Lounge, and this space occupies the entire second floor of our building. Depending on the size and configuration of your party, the area can accommodate 90 people at high-top cocktail tables, or approximately 30 for a sit-down dinner. If you plan to hire a band or DJ, there’s plenty of room for them to set up and for you and your guests to dance the night away. As with Ramen Alley, the Big Boy Lounge is booked on a minimum sales rate, and no deposit is required to reserve the space. 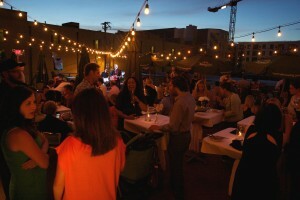 If you want to have an amazing outdoor party, then our Stryker’s Lookout rooftop patio is the ideal spot. This space is only available during the summer months, and can accommodate 75 to 200 people, depending on the size and configuration of the tables. If you’re having a wedding reception in June, a family reunion in July, or an anniversary party in August, Stryker’s is a great place to hold your event. Again, this area is booked on a minimum sales rate, but unlike Ramen Alley and the Big Boy Lounge, a deposit is required to reserve the space. When you contact us to reserve the space, we’ll discuss the details and costs associated with it. If you love Japanese cuisine, sake, or just want a unique place to have your party, contact Moto-i today. We enjoy meeting new people and helping them pull off the greatest event of the year. Every guest that attends will have an amazing time, and someone may decide to have their next event at our restaurant! Call us today at (612) 821-6262, fill out our online contact form, or stop by our location at 2490 South Lyndale Avenue to find out how you can reserve one of our three private areas.